"Can we capture the unpredictable evolutionary and emergent properties of nature in software? Can understanding the mathematical principles behind our physical world world help us to create digital worlds? This book focuses on the programming strategies and techniques behind computer simulations of natural systems using Processing." The book release is also a perfect example of how publishing should work. You can read the whole book in HTML online (of course, the design is exellent). HTML version includes clear illustrations of all concepts and also numerous embedded Processing sketches. As you go through the book, you see examples of codes and next to them running sketches (so you can see exactly what code does dynamically). You can also download all the code examples, as well as all of the source files for building the book. You can also buy the book in PDF format - selecting any price you want from $ 0.00 to $ $ 50.00. 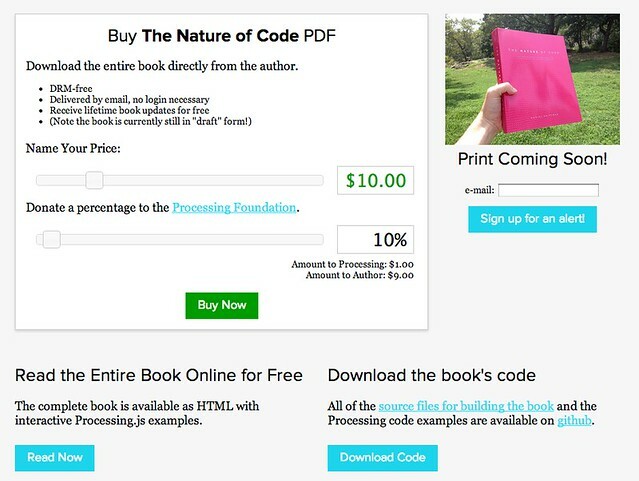 And you can donate any percentage of the money to Processing Foundation.